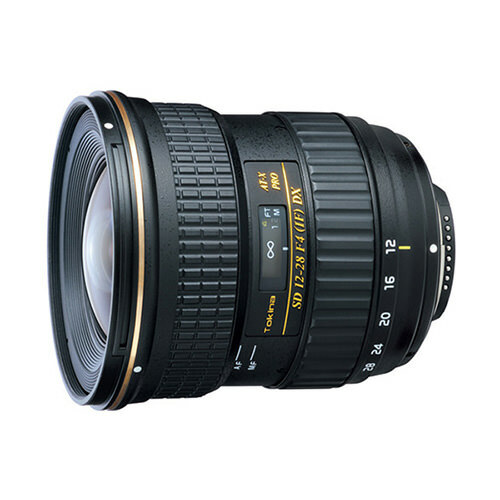 Lens Description: The 12-28mm f/4.0 AT-X Pro APS-C Lens for Canon from Tokina is a wide-angle to standard length zoom lens with a maximum aperture of f/4.0. It is compatible with Canon APS-C cameras and provides a 35mm focal length equivalency of 19-45mm. This compact lens features a one-touch AF/MF clutch operation to switch back and forth between auto and manual focus, for manual focus slide the focus ring back and for autofocus allow to the ring to rest in the forward position. A newly designed GMR (magnetic precision) AF sensor is mounted close to the AF motor and provides fast, accurate AF. The lens\' Silent Drive-Module means that autofocus responds smoothly and silently, which is ideal when shooting HD video.